I sometimes take photos. I sometimes feature one on the front page of this site; I keep a record of all such indexpics. My real current camera is my iPhone SE, but I have a Sony RX100-III gathering dust in a drawer most of the time. I have taken a few nice pics with it over the years, but not really enough to justify buying it. iPhone 5s, iPhone 4s: great cameras, great software, basically made my compact redundant. Panasonic FS-15: I didn't click with this one. Did the job. Panasonic TZ-3: loved it, lost it. Casio Z60: didn't like this one, too plasticly. 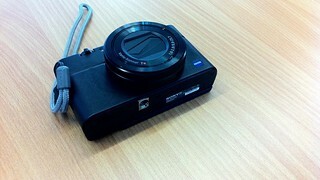 Casio Exilim Z40: Loved this camera. EVF, docking station; great feel. This started me on the road of amateur photography in 2004. I have a small set of photos on flickr. Noah Grey, sadly gone. (what happened to Noah Grey?) Oh wait, back!